Among the many changes swirling around the recent reelection of President Barack Obama, proposals to raise the capital gains tax are being met with trepidation, particularly from those with a large number of assets. Although the matter is still under debate, numerous investors and homeowners are scrambling to calculate whether the new tax law will force them to divest themselves of assets such as income property or other expensive purchases. 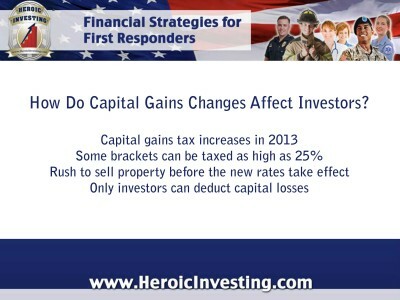 For heroic rental income property investors, the capital gains tax can affect the outcome of property transactions. The capital gains tax is imposed on virtually all assets that are privately owned, including real estate. When a capital asset is sold, the difference between the amount paid for the asset and the amount for which it’s sold is either a capital gain, if money is made on the transaction, or a capital loss, if money is lost. While capital losses can benefit investment property owners, capital gains can be a tax liability – especially if the capital gains tax goes up, as promised by the administration, for Obama’s second term. Capital gains and losses can be classed as either short or long term, depending on the length of time an investment property is held before it’s sold. If a property is held for more than a year, it’s a long-term gain or loss; for less than a year, it’s considered short term. These two kinds of capital gains and losses are balanced against each other when the net gain is being calculated. Although changes may be looming for the structure of the capital gains tax, rest assured it is here to stay. But for income property investors following Jason Hartman’s investment strategies, the current law allows offer some benefit not available to residential property owners. While real estate investors see only that capital gains taxes are slated for a raise in the coming years of Obama’s presidency, as written, these laws offer benefits for investors as well as those owning a home for residential purposes.